Collaborate to Innovate is a group for innovators and entrepreneurs who enjoy sharing ideas and doing collaborative work. It is organised by Liam Darmody, Vanessa Picker, Petra Dzurovcinova, and John Baxter. The monthly meetups happen in Adelaide. On the 30th of August 2012,Thursday, 6:30pm, I am the featured guest speaker of the month. And, I will be talking about the topic, “It Takes a Community to Build a Company and a Career”. This will cover the concept of how successful ventures can happen when we learn to build and to nurture our relationships – from friends and family to work partners and professional contacts. It’s a topic that is really quite close to my heart at the moment, as I’ve been witnessing several projects get traction when individuals learn to operate as part of a community. It’s when tiny ideas become part of bigger dreams. And, that’s when small projects turn in to massive global ventures. We are becoming inter-connected nowadays and harnessing those connections can often be the key to building and growing a company and/or a career. 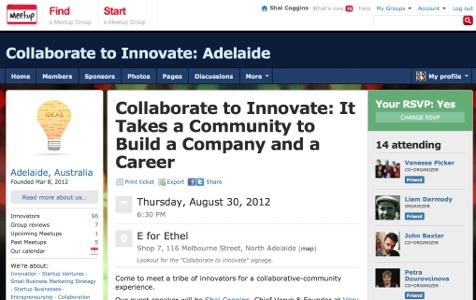 If you’re in Adelaide and you would like to take part in this discussion, please join me and the Collaborate to Innovate crew on 30 Aug at E for Ethel, Shop 7, 116 Melbourne St, North Adelaide. Happy to take your questions, if you have any beforehand. You can RSVP at the MeetUp page. To follow the Twitter stream, check out #C2IADL . Also, on 18 August 2012, TEDx Macquarie University 2012 is happening, with the theme “No Boundaries”. If you’ll be in town, do check it out. Liam Darmody, one of the organisers of Collaborate to Innovate, is the licensee and co-curator of this event. TEDx Macquarie University is now on its second year.